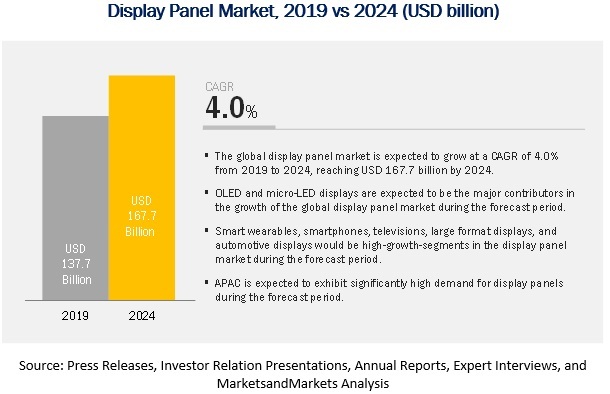 [227 Pages report] The display industry is witnessing several developments with the commercialization of newer display technologies micro-LED and QD. Various types of display panels, such as micro, rigid, and flexible, can be manufactured utilizing technologies such as organic light-emitting diode (OLED), LED-backlit LCD, direct-view LED, and micro-LED. 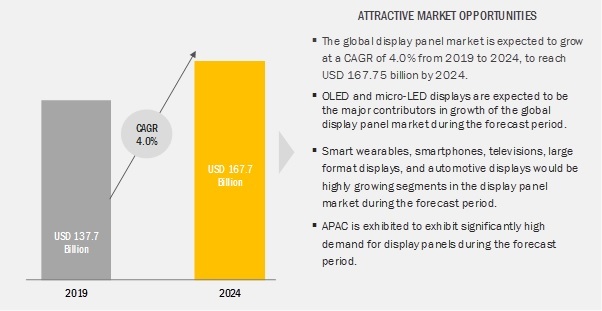 The display panel market is expected to grow from USD 137.7 billion in 2019 to USD 167.7 billion by 2024, at a CAGR of 4.0% from 2019 to 2024. Growing adoption of OLED displays in smartphones; huge investments toward, along with government support for, construction of new OLED and LCD panel manufacturing facilities; and increasing demand for 4K and 8K displays with the availability of UHD content are the major driving factors for the market’s growth during the forecast period. Factors like increasing deployment of HUD, central stack display, and instrument cluster in automotive vehicles; and rising focus toward technological shift and development of energy-efficient, attractive, and high-end-specification display products are also contributing significantly toward the display panel market’s growth. Increasing demand for display panels with high resolution, fast response time, and better picture quality is expected to direct the display panel market toward major innovations, and subsequently significant growth. High growth opportunities can be identified in emerging use cases including smart displays, smart mirrors, smart home appliances; emerging display technologies such as micro-LED and true quantum dot; and smart wearable display segments that include AR/VR HMDs and smartwatches. Smartphone, television, and automotive segments are also expected to offer high growth opportunities. Smartphones have been dominating the display panel market, with Apple and Samsung dominating the whole smartphone segment. The growth of the display panel market for smartphones will be propelled mainly by OLED and flexible displays during the forecast period. At present, flexible OLED technology-based (highly priced) display panels are being adopted in smartphones at a high rate globally; this trend is expected to continue during the forecast period. The major factors boosting the use of OLED displays in smartphones include energy-efficiency, sunlight readability, vivid color and picture quality, and easier recyclability than LCDs. The market for micro-LED displays is expected to grow at the highest CAGR during the forecast period. Micro-LED is an emerging display technology and has the potential to disrupt the LCD and OLED display ecosystem. Increasing demand for brighter and more power-efficient display panels for smartwatches, mobile devices, and NTE (AR/VR) devices will be the major factors for the growth of micro-LED technology in the display panel market. Considering current manufacturing capabilities, prototype development, and the involvement of leading players Apple, Samsung, and Sony , micro-LED-based smartwatches and NTE devices may enter the commercial phase in 2019. At present, large-sized display panels are in demand for televisions, PC monitors and laptops, signage and some tablets; therefore, the large-sized display panels account for the largest market share. However, small- and medium-sized display panels are expected to gain share in the global market during the forecast period. The growth in this segment will mainly be driven by high growth of OLED display panels, especially for smartphones. APAC is the leading region in terms of production and consumption of display panels. The region has witnessed significant advancements in the display device market, along with rapid changes in terms of adoption of new technologies. The huge market size in APAC is because of the rapid industrialization, as well as the presence of a large number of OEMs and many consumers in the region. Major companies such as Samsung Electronics and LG Electronics being based in South Korea, and Sony, Sharp, Panasonic, and a few others being based in Japan, contribute significantly to the display panel market’s growth in this region. Samsung Electronics Co. Ltd (South Korea); LG Display Co. Ltd. (South Korea); BOE Technology Group Co. Ltd (China); AU Optronics Corp. (Taiwan); Innolux Corp. (Taiwan); Japan Display Inc. (Japan); Sharp Corp. (Sharp, Foxconn) (Japan); China Star Optoelectronics Technology (CSOT, CDOT, TCL) (China); Tianma Microelectronics Co. Ltd. (China); and Truly International Holdings Ltd. (Hong Kong) are the leading players in the display panel market. BOE is one of the very few companies that have witnessed rapid growth in the display panel market. Its display business revenue grew by ~33% in 2017 (compared to 2016), whereas its R&D investment increased by 66% during that period. The company is focused on market expansion and strategic client cooperation in new application areas such as automobile, retail, industrial, healthcare, and education. Samsung Display is the leading producer of small- and medium-sized AMOLED displays for smartphones and other devices. In 2017, the company generated approximately USD 30.5 billion in revenue from its display business, 69% of which came from OLED display panels. Samsung has utilized its AMOLED displays in its flagship smartphones, such as the Galaxy lineup, and the company has witnessed high growth in 2017 with Apple’s adoption of AMOLED displays in its smartphones. In August 2018, AU Optronics launched the 85-inch 8K4K bezel-less ALCD TV display, which combines bezel-less, next-generation HDR, 120Hz ultra-high refresh rate, and quantum dot wide color gamut technologies to deliver exceptional image quality and appearance. In August 2018, Innolux showcased the world’s first OLED watch (1.39-inch 400*400 P-OLED flexible smartwatch with LTPS process). In August 2018, Tianma announced the commencement of its G6 OLED production line’s operations at Wuhan, China. The production line uses LTPS substrate and has complete core process capability, such as OLED evaporation and packaging. It supports the production of rigid as well as flexible OLEDs. In June 2018, Samsung Electronics introduced “The Wall Professional” at the InfoComm 2018. It is a large-format indoor micro-LED display which can be extended to hundreds of inches and offers brilliant presentation quality. What are the opportunities for display panel manufacturers? How much growth is expected from LCD, OLED, and micro-LED displays in the market and what would be the impact of these display technologies on different products? Who are the major current and potential competitors in the market, and what are their top priorities, strategies, and developments? What can be the potential impact of commercialization of micro-LED and True QD displays? The study involved 4 major activities for estimating the size of the display panel market. Exhaustive secondary research was done to collect information on the market, including its peer markets. The next step was to validate these findings, assumptions, and sizing with industry experts across the value chain through primary research. Both top-down and bottom-up approaches were employed to estimate the complete market size. After that, market breakdown and data triangulation were used to estimate the market size of segments and subsegments. In the secondary research process, various secondary sources have been referred to for identifying and collecting information important for this study. Secondary sources include corporate filings (such as annual reports, press releases, investor presentations, and financial statements); trade, business, and professional associations (such as Consumer Technology Association (CES), Integrated Systems Europe, Camera & Imaging Products Association (CIPA)); white papers, display-based–marketing-related journals, certified publications, and articles from recognized authors; gold and silver standard websites; directories; and databases. Secondary research has been conducted to obtain key information about the industry’s supply chain, market’s monetary chain, the total pool of key players, and market segmentation according to industry trends to the bottom-most level, geographic markets, and key developments from both market- and technology-oriented perspectives. The secondary data has been collected and analyzed to arrive at the overall market size, which has further been validated by primary research. In the primary research process, various primary sources from the supply and demand sides have been interviewed to obtain the qualitative and quantitative information relevant to this report. Primary sources from the supply side include key industry participants, subject matter experts (SMEs), C-level executives of key companies, and consultants from various key companies and organizations operating in the display panel market. After the complete market engineering (including calculations for market statistics, market breakdown, market size estimations, market forecasting, and data triangulation), extensive primary research has been conducted to verify and validate critical market numbers. Primary research has also been conducted to identify segmentation types and key players, as well as analyze the competitive landscape, key market dynamics (drivers, restraints, opportunities, and challenges), and major growth strategies adopted by market players. During market engineering, both top-down and bottom-up approaches have been extensively used, along with several data triangulation methods, to estimate and forecast the market, including the overall market segments and subsegments listed in this report. Extensive qualitative and quantitative analyses have been performed during the complete market engineering process to list the key information/insights throughout the report. In the market engineering process, both top-down and bottom-up approaches, along with several data triangulation methods, have been used to estimate and validate the size of the overall market and other dependent submarkets listed in this report. Extensive qualitative and quantitative analyses have been performed during market engineering to list key information/insights. Major players in the market have been identified through secondary research, and their market shares have been determined through primary and secondary research. This involved studying the annual and financial reports of top market players, and interviews with industry experts (such as CEOs, vice presidents, directors, and marketing executives) for key insights both quantitative and qualitative. All percentage shares, splits, and breakdowns have been determined using secondary sources and verified through primary sources. All possible parameters that affect the markets covered in this research study have been accounted for, viewed in extensive detail, verified through primary research, and analyzed to obtain the final quantitative and qualitative data. This data has been consolidated and supplemented with detailed inputs and analysis from MarketsandMarkets and presented in this report. After arriving at the overall market size through the process explained above, the total market has been split into several segments. To complete the overall market engineering process and arrive at the exact statistics for all the segments, the market breakdown and data triangulation procedures have been employed, wherever applicable. The data has been triangulated by studying various factors and trends from both demand and supply sides. The market has also been validated using both top-down and bottom-up approaches. To estimate and forecast the display panel market, in terms of volume, segmented on the basis of product and display technology.